This weekend I decided to get a little crafty and try to see how hard it would be to cut fabric with my Silhouette Cameo. So first, I did a little Googling on the subject, watched this video and read on a few forums about how the fabric would need to be interfaced before cutting it to make it stiffer and easier to cut. I read that Heat’n Bond was the best product to use so that’s what I went with.The bonding agent I bought was awesome as first you interface the fabric and then all you need to do is peel off the back layer and it becomes an iron on bond to another piece of fabric. It is a little more expensive than regular interfacing but since I wanted to iron on and no-sew this project it was actually cheaper, and done all in one step! 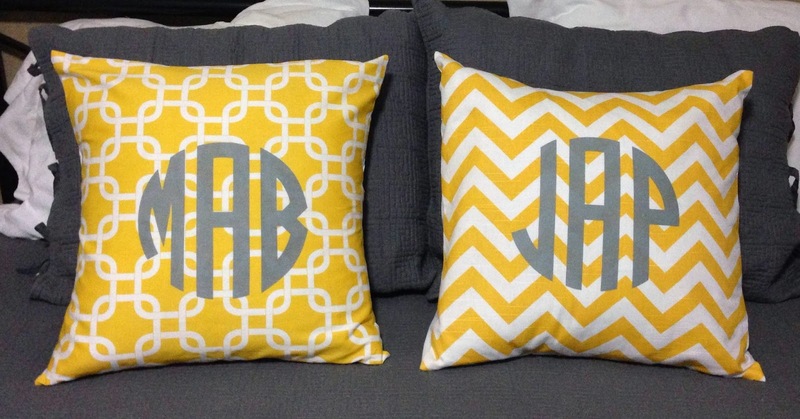 For my first fabric project I decided that I wanted to monogram the throw pillows on our bed! We have had these pillows for about 18 months and I was ready for an update because I hear chevron print is on it’s way out! I first decided how large I wanted my monograms. I chose 8×8 inches as my pillows are 16×16 and I wanted to have a good size monogram but not too huge where it dwarfed the pillow. I wanted a circle monogram so I used the font I purchase from FontBros. After that I just cut my fabric and ironed it well and cut the correct size of the Heat’n Bond to adhere to it. Next I was ready to load it into my machine to be cut. It really was as easy as setting the Silhouette to the settings the software recommended and hitting cut! 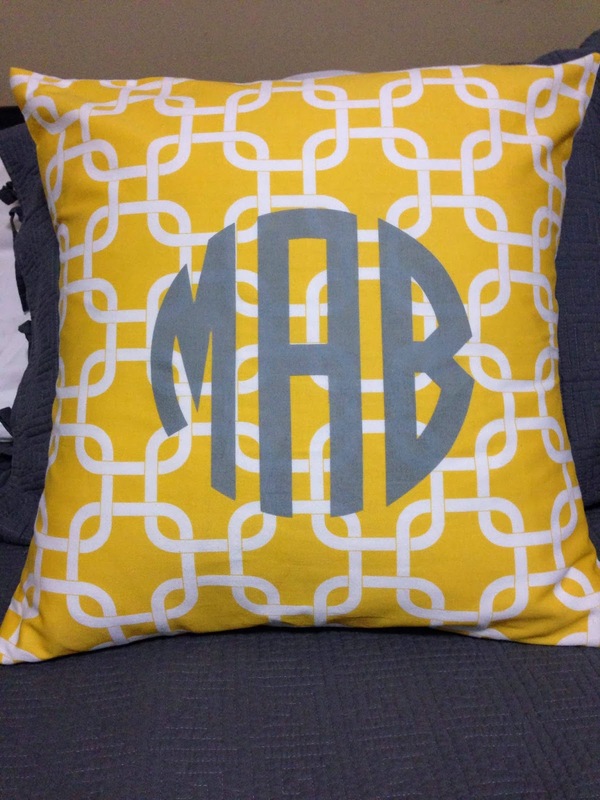 Out comes a perfect fabric monogram in about 60 seconds! Finally all you need to do is pick out the inner parts of the letters and then iron them onto your pillow case!! I am so excited to use this machine to cut fabric! I now have tons of ideas flowing through my head for the holidays and beyond! I am glad it was so easy and that it didn’t tear up the blade. I will say that there is a fabric blade for the Cameo that is recommended but I had a thin cotton fabric and there was no issue for the machine to cut it at all. I have now cut paper, vinyl and fabric with my cameo. It really is an amazing tool and I think I have only scratched the surface of all that it can do! Stay tuned for more crafty ideas! You are so crafty!!! LOVE these! You're so sweet! I love reading your blog because you formerly lived in Mississippi and because you are fabulous!! Although I am only a Mississippi transplant, I have enjoyed my time here very much!